Strong notes of ‘pleasantly surprised’, with a hint of ‘incredulity’ and undertones of ‘faith restored’. It may sound like one of the more abstract tasting notes you’ve read, but it’s actually a description of my initial feelings when I found out about Lagavulin’s limited edition 8yo, released as part of their 200th anniversary celebrations. Many of you will have an opinion on, or will certainly be aware of, all the talk surrounding non-age statement releases, and what they replace, how they’re priced, what they represent and how they’re marketed. I’m not going to go into much of that now, for that is several blog posts on its own just to summarise the current debate, let alone critique individual examples. Suffice to say that when I found out Lagavulin’s hotly anticipated anniversary bottling would carry an, albeit young, age statement and be reasonably priced, I found myself hoping that this may be the whisky to really further the cause towards greater product transparency. 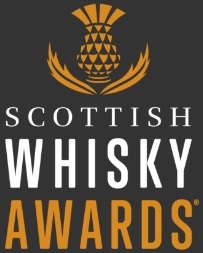 Leading by example are Compass Box, who broke new ground by explaining exactly what their ‘Flaming Heart’ and ‘This is Not a Luxury Whisky’ blends are comprised of, and (until the SWA got involved) provided very clear illustrations of these recipes. Bruichladdich have very willingly jumped into bed with Compass Box on this issue and I applaud them for it. What the campaign for transparency has really lacked, though, is the involvement of one of the big boys. Yes, Lagavulin 8yo may be a one-off for a birthday celebration. Yes, it’s not part of the core range. 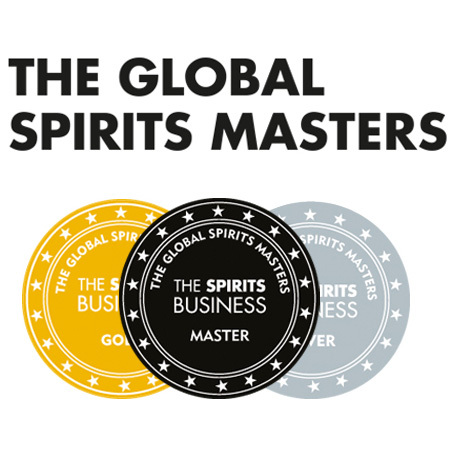 Yes, Diageo haven’t sent out a press release stating they are of the same transparency opinion as Compass Box and Bruichladdich, but in a way those things almost don’t matter. 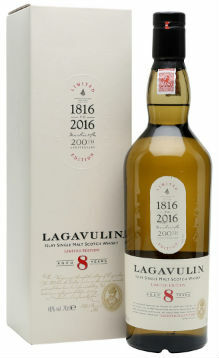 Lagavulin 8yo has been out for a little while now, and it’s been receiving very, very good reviews. When someone like Serge Valentin at Whisky Fun gives a new, youngish whisky a score of 90/100, people take notice. I take notice, some of you probably do too, and undoubtedly other brands take notice as well. In time, maybe they’ll come to realise that so long as the liquid’s good and it’s fairly priced, a young release can indeed have an age statement and not be snorted at. It should be embraced, communicated to consumers truthfully, and be judged fairly on what it truly is. Here endeth my crusade. Nose: Cracked black peppercorns, grassy meadows, lemon juice, pineapple, kiwi and some blueberry sweetness to begin. Then slate, mossy earth, sweet smoke and charred logs. Very enticing. Palate: A chilli spice to begin with, followed by some banana foams and a peach and apricot sweetness. Then it’s briney, with grapefruit and lime, before the thick smoke rolls in, alongside walnuts and mouthwatering tannins. Finish: Intense peat smoke, with some floral notes and tropical fruits. Overall: An excellent whisky. 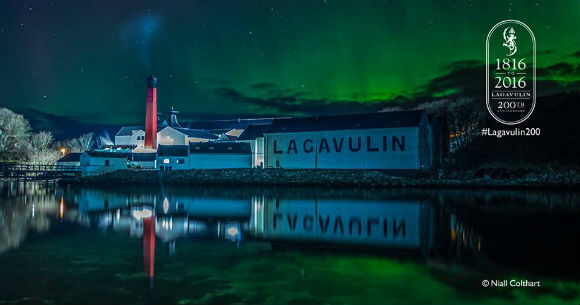 Very special indeed, and a fitting way to celebrate Lagavulin’s 200th birthday. The distillery character comes through in spades, but the influence of the cask is also apparent. Very complex, wonderfully satisfying and a bargain at a smidgen over £50. If this is how Laga are starting their 200th birthday party, I can’t wait to see how it ends. This entry was posted	on Friday, April 22nd, 2016 at 12:34 pm	and is filed under Reviews. You can follow any responses to this entry through the RSS 2.0 feed. Responses are currently closed, but you can trackback from your own site.